Are you looking for an expert and a solution to clean up and remove your unwanted rubbish? 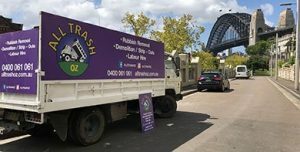 All Trash OZ Demolition and Rubbish Removals’ gives a fresh take on the industry. Providing you with a professional company in Sydney that is easy and friendly to deal with. The lowest prices are here for you every day! Flexible, low-cost Rubbish Removal & Demolition tailored to your needs. 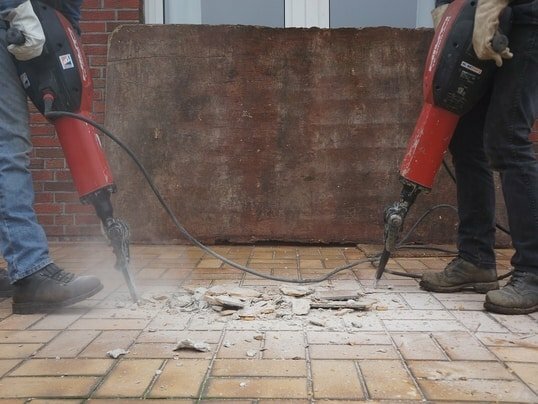 Quick and Efficient Demolition and Rubbish Removal is provided to you. NO Exceptions. Customized to suit your convenience, an easy process keeps everything very simple from start to finish. Looking for an expert and a solution to clean up and remove your unwanted rubbish? All Trash OZ Demolition and Waste management gives Rubbish Removals and Demolition a fresh take on the industry. Providing you with a professional company in Sydney that easy and friendly to deal with. Ask our team about our Special Offer this month. Committed, keen and on-time to get rid of your trash. No surprises guaranteed! Just an honest quote and solution to your problem. 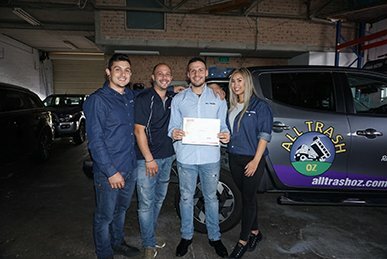 All Trash OZ Demolition and Rubbish Removals’ has earned the reputation of one of Sydney’s best Rubbish-Removals and Demolition service. The ideal destination for your garbage disposal and strip-out needs in Sydney is All Trash OZ. 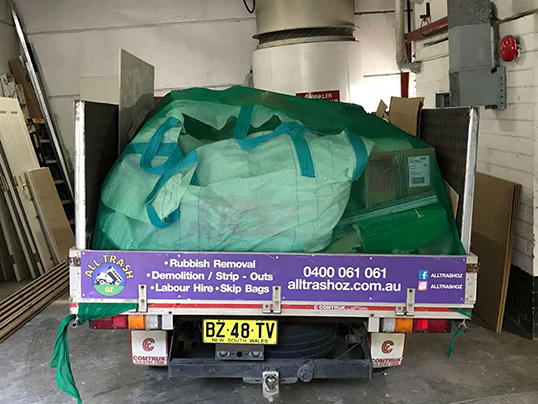 Simple, efficient and affordable rubbish collection services all over the region, from the Western Suburbs to the North Shore, Northern Beaches, Eastern Suburbs and many more. All Trash OZ, strive to make sure that you, the customer, are always satisfied. Your happiness is very important and a main priority to the company and team. 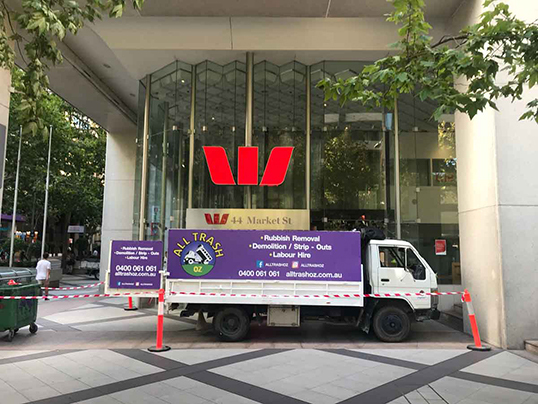 Lots of happy, satisfied customers return to receive an unquestioned rubbish removal and demolition service in Sydney over and over again. Being honest and upfront with you makes the whole process easy and enjoyable. What you see is what you get and everything is transparent to keep things as clear as possible. Attention to detail, skilled staff and excellent equipment give All Trash Oz the edge over the competition. Whether it’s at home, in the office, on site or any where you can think of – All Trash Oz’s versatility can accommodate for you. There is no job too big or too small. From knocking down a house to removing your mattress. 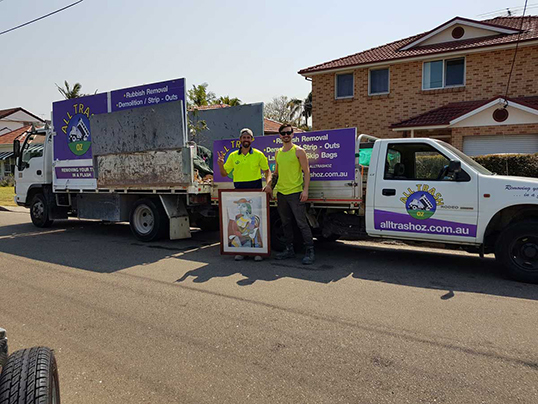 There are almost no limits to your service, whether it’s household waste, office waste, builders waste, green/garden waste, industrial waste or any kind of debris, the team at All Trash Oz have seen it all and are equip to not only leave your site spotless but also leave you smiling. You don’t need to break your back loading or cleaning up after us, that’s taken care of. Recycling all we can also help keep the costs down, for a win-win situation. Getting rid of all your excess rubbish can be a stressful process, but only if you don’t choose All Trash OZ! Every step of the process is made perfectly simple just for you. Call now or simply apply online (receive a 10% off discount) and you will get a fair, honest quote with no hidden fees. 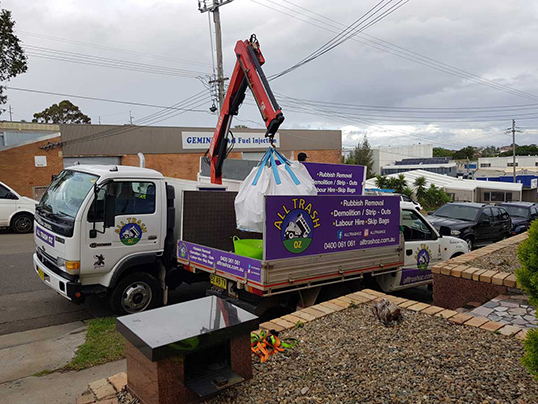 Servicing the Eastern Suburbs and the greater Sydney Rubbish Removals suburbs. 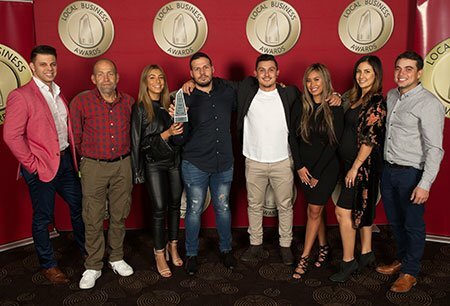 You can smile as you watch the experts of the “Rubbish Removals & Demolition” industry of Sydney NSW, always helping you keep your costs down. Cost effective Rubbish Removals & Demolition is what you get with All Trash Oz. Providing a thorough description of the service over the phone where possible and if we can’t help you over the phone we will come out to you and help you in person. Arriving on time with a call at least half an hour before we get to you. Recycling as much as possible, helping you to keep the costs of your removals down, and the environment green. Saving money and getting the job done for you is easy with the ‘know-how’ and right equipment. Once your rubbish is loaded in the truck, a thorough sweep up is done leaving your place spotless. You will be left smiling long after the truck has left. When you combine technology and the right equipment, the result is outstanding. You have the benefit of both at All Trash Oz. Using the latest technology, right equipment and a highly trained team you ensure that you have a job done efficiently and effectively. The best and most affordable Rubbish Removals and Demolition company in Sydney for your convenience. Why Choose All Trash Oz? Caring about you is what we do! You will feel good knowing you are with the best! Contact us today for a straight up reliable solution. The hard work is done for you by the best Sydney demolition and rubbish removal team that leave your establishment and/or grounds spotless. Sounds good? Take a look at all the reviews to see for yourself. Let’s start by helping you out with your Demolition or Rubbish Removal needs in Sydney and adding you to a list of happy customers! For more information on our Rubbish Removal or Demolition services, contact All Trash OZ on 0400 061 061. Or go to the “Get a Quote” form located at the top right of this page for a discount now!